No, this should not be here. But I’m kind of impressed that it is. I believe this was a Tuesday or Wednesday, and at the time I thought it would for kind of an interesting picture but didn’t want to be late for work so I just kept on biking. On Friday I saw that the cart was still there, so I hopped off my bike and went down to see if I could use this in any way to create an interesting picture. I tried a couple different angles and it just wasn’t working out, mostly because the greenery around the cart was so thick that you couldn’t really see the cart itself in most of the pictures. 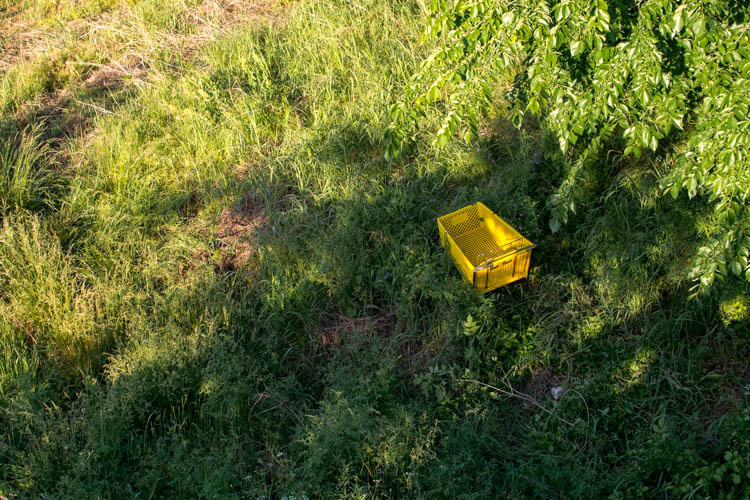 I also realized that when I was on the grassy ridge it was difficult to get a sense of place and context, which made the picture of a yellow shopping cart a little too mundane and boring. 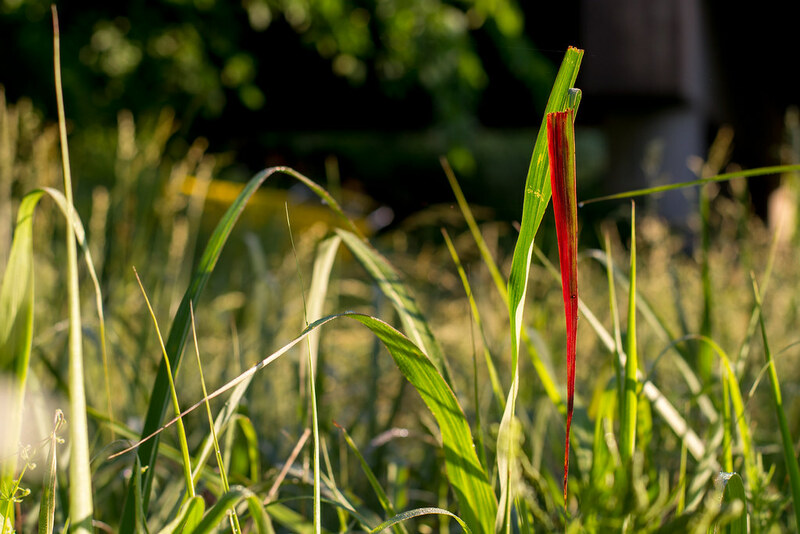 I really wanted to take advantage of the setting and the early morning light, so I searched around a bit to see if anything stood out to me and that’s when I saw the dark red piece of grass that ended up being the subject for this week’s picture. If you look close the grass is barely attached to the main stalk. I think it has turned red as part of the dying process, and my guess is that it will soon become brown and fall off. The richness of the color kind of took me off guard, and when I got down low to photograph it I noticed something in the background I could use as a little extra compositional bonus: the yellow shopping cart :) If you look near the top left corner you will see a faint yellow stripe which is the top of the cart, and though it was not entirely intentional I thought it added a fun extra bit to the image overall. Nature is full of surprises and most of the time we are oblivious to them. I think your post illustrates how unobservant we usually are in life, passing by many opportunities to see the beauty about us as we busily rush on to our next appointment. Thanks for sharing your discovery. Funny you should mention Auto ISO, David. I have been using it for so long I kind of forgot what it was like without it, and last week when I was on vacation I ended up turning it off for some night time shots. The next day as I snapped a few pictures of my nephew I realized the shutter speed was way too slow and my pictures were all blurry! I quickly turned Auto ISO back on and it was like a breath of fresh air. Cameras today (like the D7100 you have, and that I was using too) are so good it’s almost silly to *not* use auto-ISO! In Havelock, when we see a shopping cart at anywhere but Russ’s, there is usually a homeless lady or bag lady pushing it along. Since you moved away, there are now three homeless ladies living here. I was in Lincoln very very briefly this week, for a matter of just a couple of hours, and we ended up stopping at Russ’s for something. My goodness that place sure has changed! I hardly recognize it anymore!